Cedar Health was started in 1987 and supplies an impressive portfolio of high quality Natural Healthcare brands offering a diverse range covering Digestive Care, Cholesterol Care, Energy, Immunity, Womens Health and Healthy Confectionery. Innovia, and Ortisan are trade names within this range. Many are backed by strong clinical research. Their products must demonstrate that they are effective either through well established, traditional use or by scientifically conducted tests. 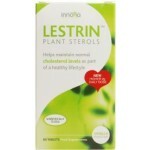 Lestrin tablets are made from a standardised extract of Beta-sisterol - a naturally-occurring sterol found in almost all plants.Plant Sterols help maintain normal cholesterol levels as part of a healthy lifestyle. Plant sterols naturally exist in plants but are destroyed when food is processed. Lestrin contains 2 of these important naturally occurring plant sterols; Beta-sitosterol and Beta-sitostanol. Plant sterols may play a role in helping to maintain normal cholesterol levels as part of a healthy diet and lifestyle.Plant sterols make an important contribution to a balanced diet, but in the western hemisphere, we eat far fewer than elsewhere in the world (partly because these components are often destroyed by cooking and other processing. Key point: Lestrin can provide an effective regulator or modulator of cholesterol without side effects of other alternatives.